One key on North Eugene High School’s best piano was completely broken. The others were so worn out they required much effort to simply coax notes from them. The instrument looked just as tired from the outside. Meanwhile, the high school’s choral program had taken off in recent years, and the aging upright piano’s quality matched the choir’s performance level about as well as a pair of old sneakers go with a tuxedo. On top of that, the upright wasn’t loud enough for the school’s auditorium — only a baby grand could do that — and North Eugene was the last high school in the Eugene school district without such an instrument. Then, in an unlikely sequence of events similar to the children’s game of telephone, the kindness and effort of several people addressed North Eugene’s shortcoming in a very big way. 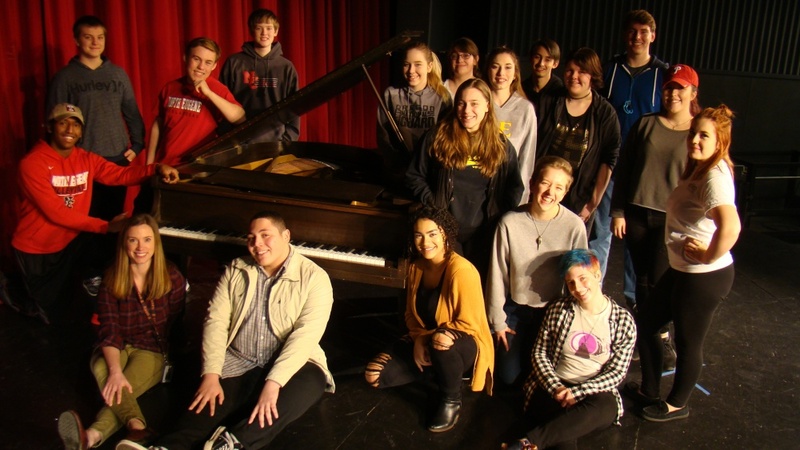 The students received not just one baby grand piano for their auditorium but one for their choir room as well, courtesy of the University of Oregon’s School of Music and Dance. The pianos are in the twilight of their careers. They can no longer withstand the rigors of the music school’s practice demands, weren’t worth the cost of a restoration, and their trade-in value would have been negligible. All told, their combined value was less than $10,000, but they are priceless to the students in North Eugene’s choral program. One part of the story begins with Mike Reiter, the music school’s piano technician. Not long after he began in 2016, Reiter was taking an inventory of the school’s pianos when he uncovered an old Gulbransen baby grand stuffed under a stairwell in the music building. Coated in a dozen years’ worth of dust, it was deemed unplayable and unserviceable years ago. Legend has it that music professor John Stark Evans composed the University of Oregon pledge song on this piano way back in 1919. The Gulbransen indeed at first appeared to be in rough shape; ivory was coming off its keys and some parts were shot. Upon closer inspection, however, Reiter found it wouldn’t take much to bring it back to life. He didn’t have a home for it, though, and put it off to the side. It wouldn’t be idle for long. The other part of the story starts with Tracy Ross, who was North Eugene’s assistant principal at the time and helped oversee the Eugene School District’s music programs. Ross wanted to see about getting North a baby grand, and asked Eugene Education Foundation Executive Director Rebecca Sprinson about funding to buy a used one. Sprinson mentioned the request to Deb Carver, who was president of the foundation’s board at the time. Carver, the former UO Philip H. Knight Dean of Libraries, also sits on the board of the Eugene Symphony Association. She mentioned North Eugene’s plight to Sara Mason, the symphony’s development director, knowing that Mason’s husband, David, was the facilities director at the School of Music and Dance. Sara placed a call to David asking if the music school still had the unused piano he had previously mentioned to her. Indeed it did, so David sent an email to North Eugene to find out more. Much to his surprise, he connected with Perdue, who he was familiar with as an alum. He inquired if she would be interested in a piano the music school would be willing to donate. “There were a lot of excited ‘CAPS’ and eager exclamation marks involved in my reply,” Perdue said. Reiter began fixing it up so it would be a worthy representative of the UO out in the community. Working on his own time during a slow part of the year, Reiter enlisted the help of a student worker, Martin Quiroga. They spent about 40 hours and roughly $800 in parts as they nursed the aging Gulbransen into fine shape. “We played the first chord on the piano, and the sound just bloomed all over the place in here,” Reiter said while sitting in his workshop. While Reiter was in the midst of that project, another baby grand that had been loaned out to a graduate student was returned to the university. This one also was tired and wouldn’t have lasted long under the steady barrage of practicing students. So Reiter tuned it up and also offered it to Perdue, who gladly accepted. Now the Gulbransen has a home at North Eugene on the auditorium’s stage, while the second, an Estey, resides in the choir room. Reiter estimates the pianos have about 10 years of life left in them, but they give Perdue’s program a boost and a chance to demonstrate to the school district that her students are worth the investment. Perdue, who is in her second year at North Eugene, is trying to maintain the upward trajectory of the school’s resurgent choir program. It would have taken years to raise the funds to buy a single baby grand. Two was out of the question. For a school that has up until recently struggled to maintain enrollment, the pianos were a wonderful gift that will have a profound, lasting impact on the program’s students. Choir member Drake Scrafford noticed the difference between the sound of the Gulbransen and their old upright immediately. Reiter even tuned the pianos perfectly to complement the choir’s sound, said Perdue, who appreciates everything that went into the effort. “It was a project for him,” Perdue said. “They’re old pianos, but inside, all that action is new. He gave them such great attention. It’s beautiful. David Mason was just glad he could help connect everyone in this circuitous and fortuitous sequence of events.